From a therapy standpoint, inclusion means “pushing into” classrooms to deliver services rather than pulling kids out for therapy sessions. 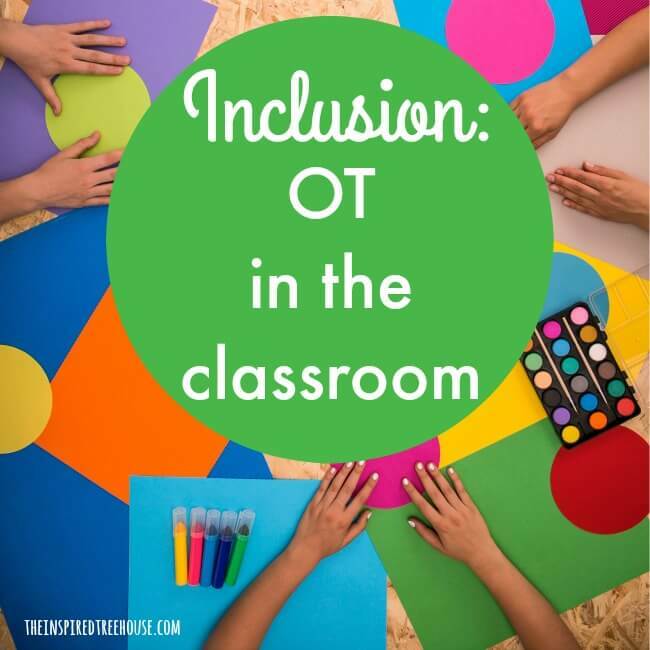 One thing I’ve learned about inclusion during my years as a school based occupational therapist…it can be tricky. Another thing I’ve learned? It’s totally worth it. I grew up with a sibling with significant special needs what I remember most about her experience in school was her desperation to fit in, to be accepted, to be treated with respect, and to be given the same opportunities as her peers. When all of the pieces fall into place – inclusive support services can be an awesome way to help children with special needs grow and thrive. 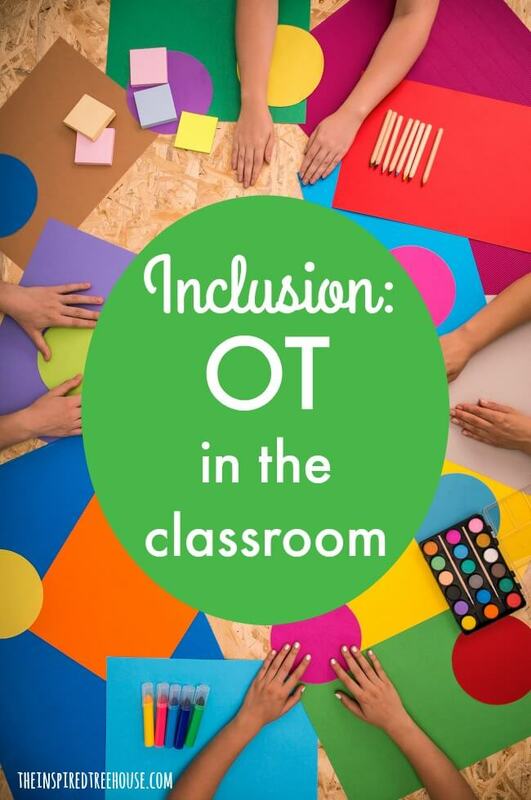 After all, the classroom is where they’re actually putting all of those fine motor, visual motor, cognitive, self care, and social skills to use – it’s the stuff occupational therapists’ dreams are made of! In many (if not most) cases, providing inclusive therapy services is simply best practice. Why? 1 || It provides kids with greater opportunities to generalize and apply skills in a natural setting. 2 || It provides therapists with better opportunities to consult and collaborate with classroom staff. 3 || Therapists gain a better understanding of how their services support actual participation and independence in the educational setting. 4 || Gives therapists a chance to model and demonstrate the use of techniques and strategies with students so they can be applied later, even when the therapist is not in the room. 5 || Children don’t feel singled out or “different” when services are provided in their classroom. 6 || Other students who may need extra support can benefit from the therapist’s presence in the classroom. 7 || There is less disruption of students’ schedules and routines when they are not being removed from class. 8 || Therapists can use peers as models and supports for new behaviors or skills. But…like I said, providing services in the classroom can be tricky. School therapists typically have BIG caseloads and we often have to address issues on the fly (bathroom, behavior, etc.). This means lots of scheduling and rescheduling (and rescheduling again) and sometimes difficulty with maintaining consistent treatment times, which can be hard when you’re trying to be in a classroom on a consistent day and time. Being able to work within a classroom also means establishing a great rapport and relationship with the teacher and the students. It takes confidence, sometimes a little assertiveness, and also a willingness to work with the classroom staff and kids to figure out how you can add to what’s happening in the classroom rather than becoming a distraction or disruption. So, what are the best ways to provide therapy services in an inclusion setting? Admittedly, this is an area that I’m always working on in my practice. I have great stretches where I’m able to be in the classroom more often, and then when things get busy, treating kids in the classroom seems to be the first thing to go. But every single school year, I make it my goal to increase the amount of time I spend in my students’ classrooms. 1 || Demonstrate activities and leave them behind. I schedule a time to go into the classroom to demonstrate exercises for kids or other activities that could be used as movement breaks for the entire class as part of the daily routine. Then, I’ll leave a list of the activities for the teacher to use later. 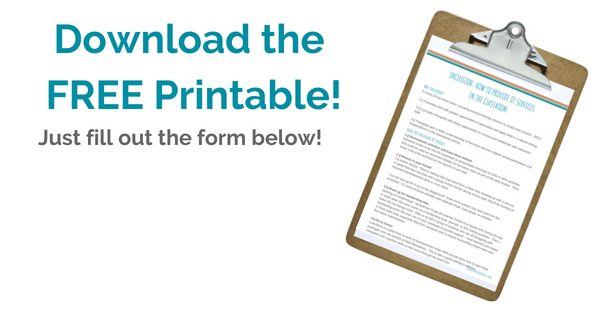 Chances are, there are many students in the classroom who can benefit from these! 2 || Recess is your friend! This works in a couple of ways…Here in Ohio, we have cold, rainy, snowy weather for a good chunk of the school year, which often means indoor recess. There’s nothing kids love more than a fresh face showing up with a new toy or game that they can play with a group of their friends during recess (and, they’ll be working on important developmental skills in a fun way!). Check out these creative indoor recess games and activities! You can also go for it out on the playground! Grab some outdoor toys and head into the sunshine! Try some of these activities with sidewalk chalk, hula hoops, or bubbles! 3 || Show up for handwriting time. Working on handwriting? Sometimes I’ll ask the teacher if there is a regular time during the day or week when the class works on a handwriting book, journals, or free writing activities. Then, I make this my therapy time! Offer to sit with a group of students who are all struggling with handwriting (even the ones not on your caseload) to provide support – most teachers are happy to have extra help, especially help from someone who is trained in providing visual motor and fine motor interventions! 4 || Use centers for therapy activities. Teachers often use a “centers” format where students break into small groups to work on different activities around the classroom. This is the perfect time to make your way into the classroom. Bring your own fine motor, core strength, visual motor, or other activity into the classroom and facilitate one of the “centers” yourself. Then, leave the materials for your “center” in the classroom for the teacher to use for the rest of the week so kids are still working on necessary skills even when you’re not there! Bonus points! Rotate your “center” out each week and you’ll likely have a very happy teacher on your hands who has one less thing to plan! 5 || Plan your own lesson. This is one of my favorite ways to get to know a classroom and to show a teacher what I’m all about. I set up a time with the teacher where I can facilitate a 30 minute lesson in the classroom with all of the children. Most often these lessons are co-treatments with my speech therapy and physical therapy friends! We put together a themed language/sensory motor lesson plan and have seen awesome results from being in the classroom and getting all of the kids in on the therapy action! Plus, it gives teachers a little break if they need to make copies, grade papers, or run to the bathroom…which we all know is a luxury to someone who has to be “on” and up in front of kids all day long! 6 || Fill the sensory table! This is one of my favorite ways to get into my preschool classrooms. I ask the teacher if she would like me to plan out some ideas for things to go in her sensory table – it could be a tactile sensory activity that goes along with the season or classroom theme, or it might be a fun fine motor activity with manipulatives. I’ll sit in the classroom and facilitate play at the table for direct service and then leave the contents in the table for a week or two before changing it out. Again, one less thing for the teacher to plan and one more fun way to get therapy into the classroom! 7 || Show up for arrival and departure routines. Be present in the classroom for the arrival and departure routines. There’s no better time to see fine motor, cognitive, and self care skills in living color than when kids first get off the bus in the morning and when they’re packing up at the end of the day. You can provide all kinds of supports (visual schedules, checklists), adaptations, and interventions during this time for dressing skills, clothing fasteners, transitions and more! And teachers will love you for being there to help at the most chaotic times of day! 8 || Try seeing kids for therapy during art, music, physical education, or library. So many great opportunities for therapy here! I’ve requested copies of songs from the music teacher to make visual picture prompts for kids to be able to follow along more easily in music class. I’ve joined in on art classes to work with kids on fine motor and visual motor skills – this is also a great chance to support kids who are hypersensitive to tactile input (lots of messy activities in art class!). 9 || Go to lunch! Lunchtime is another great time to provide inclusive therapy services. It’s a great way to work on functional fine motor skills as kids learn how to open food packages and use utensils to feed themselves and also the place to be if you want to work with kids who are picky eaters due to sensory processing concerns. So what are your best tips for providing inclusion therapy services? We’d love to hear them! Share in the comments below or leave us a post on our Facebook page! Great article—–I have been providing OT with a push in model for years and agree it is totally the way to go! I love these ideas! I always struggle with how to bill for these services when I push in. What are your recommendations? I have actually been encouraged to push-in in addition to their other treatment time. But to me, this seems to go against what I have l learned regarding provision of services/ethics…not to mention I don’t have a whole lot of time to spare to provide ADDITIONAL services! Hi Kay! Wouldn’t it be nice to have time to provide “extra services”? :) This kind of time simply doesn’t exist in my schedule (or any other school OT I know!). When I provide services in the classroom, I count it and bill it as the child’s treatment time for the week as usual – as long as I’m actually providing direct services. If I’m consulting or collaborating with the teacher, I just document it as indirect service but count it toward the child’s monthly minutes. Of course, this all depends on how you have your services worded on the IEP (direct vs. indirect, one-on-one vs. in the classroom). Hope this helps! My concern too is the treatment billable time…..if you are doing a center and your OT child moves in and out of that center and you end up working more with other students vs. the one on your caseload, how do you account for that time? I just question if they will truly get their 30 minutes (though I realize teachers will be providing extra interventions throughout the week with follow through just by observing OT activities) I love the idea of push in services but feel I might need to make changes to goals or time if we go this direction. Any thoughts or suggestions? Thanks! I sometimes get my while caseload involved. For example, I may make homemade play dough with my MoID kiddos as part of life skills training and then use the homemade play dough later in the week with my SDD- K kiddos doing kinesthetic letters. I’ve been trying to work on getting into the classroom more as well, but I wasn’t sure how. You gave some great ideas. would you mind sharing a few of the activities you’ve created at centers? Or share some other examples of what you specifically do in a few of your classroom? Hi Patricia! Thanks so much for stopping by! I’ve used all kinds of commercial fine motor games and also some “homemade” activities during centers – check out this link for fine motor ideas that I love to use: https://theinspiredtreehouse.com/fine-motor-skills-20-creative-activities-for-kids/ Hope this helps a little bit! Hello…I just came across this as I was doing some research. I work in a very similar way, but am struggling to find a way to capture treatment times better. I work at a school where most students are on my caseload, so when in the classroom I am servicing multiple kids for varying amounts of time rather than working with one particular student. Do you by any chance have a way of managing this that you would be willing to share? This is a great article! I work in 4 inclusive preschool rooms and have to justify this model all the time! I often feel I am alone in my passion. So happy to hear you and many others are also passionate. Hi! I’m an italian student of OT and in my thesis I’ve made an intervention with kindergarten based on the development of prerquisites of handwriting. I’ve worked in the school with the entire class. What do you think about it? In Italy school-based OTs are unfortunately absent. Sorry if I make some grammatical errors. Do you have any ideas for classroom inclusion in Middle School besides going into Art or Music Class? How to help in Science, Math, Language Arts at this level? I am not part of the OT community but have read the articles from The Inspired Treehouse in the past and have found them to be interesting. From this article I liked idea #2 Recess is your Friend as I am passionate about kids getting recess time for the physical and social benefits. I am often frustrated to hear that recess has been cancelled for budgetary or mandated scheduling reasons. It is important for kids to have a recess period and it would be great to have an OT around for some time with the students. OK. That’s my two cents worth. I enjoyed the article and appreciate what all the teachers and OTs out there do for our children who will grow up to be the futures leaders of our world. I am trying to do more of a push in model at my school and was wondering how you all are making the student’s goals? I find it hard to work on an individual handwriting or cutting goal when I’m doing groups. Does anyone have any examples of goals? Thanks!